Mexico City is the world’s most populated city with over 20 million people. Founded by Spanish conquerors in 1521, Mexico’s capital sits at 2309 metres above sea level and was built on the site of the ancient Aztec capital of Tenochtitlan. The extensive metro system and trolley buses make getting around easy and there is certainly plenty to see and do here. This morning you will meet your private guide and spend the day exploring Mexico City and the nearby archaeological site of Teotihuacan. A good starting point is the main square where you will find the impressive Catedral y Sagrario Metropolitano, the main cathedral of Mexico City with a magnificent Latin-Baroque style façade. 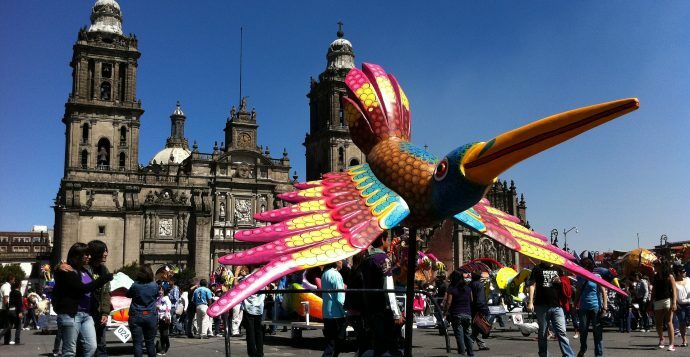 The enormous Zocalo has been the heart of the city since the Aztec rule at the time of Montezuma I. This area was once surrounded by palaces and temples and it is now the second largest public square in the world. You will gain an understanding of Mexico’s history, culture and people, visiting highlights such as Templo Mayor and the National Palace where you can see murals depicting the struggle for independence by one of the country’s most famous artists, Diego Riviera. 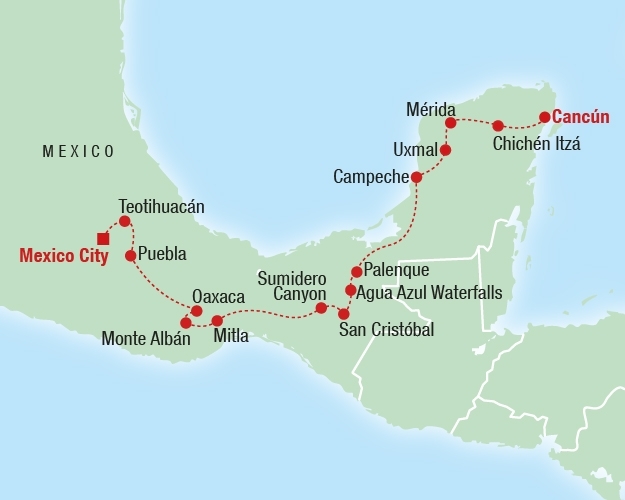 This morning you will meet your private guide and depart for Oaxaca. En route you will visit the colonial city Puebla, flanked by four of Mexico’s best-known volcanoes – Popocatepetl, Iztaccihuatl, Malinche and Citlaltepetl, also called Pico de Orizaba. The historic centre of Puebla has been named a UNESCO World Heritage Site and there more than 70 churches and 1000 colonial buildings located here. With your guide you will visit the Zocalo, the Cathedral and the Rosary Chapel. Puebla is famous for hand-painted Talavera tiles and was the first city in New Spain to master the art of decorating and glazing fire-baked clay – an art introduced by the Spanish. Spanish tile makers took up residence in Puebla and set a standard of excellence that prevails to this day. You will see tiles adorning many churches and other buildings around town.